25 December 2007 - May you and your loved ones enjoy the true meaning of Christmas and have a prosperous New Year. Let's all give thanks for what we have and pray for a more peaceful year in 2008. 18 December 2007 - Eduardo Fadul of Columbia has been very busy over the past few months. He has just released several packages covering the Mirage 5/50, the IAI Nesher, and the IAI Kfir. Included in the base package of each set are new instrument panels and appropriate sound files. The first set is for the Mirage 5 and Mirage 5M, both in Colombian Air Force markings with many configurations. Three expansion packages add additional configurations and markings for the Mirage 5 and 5P of the Peruvian Air Force, the Mirage 50EV of the Venezuelan Air Force, and the IAI Dagger of the Argentinian Air Force. The second set of aircraft is for the IAI Kfir C2/C7. Included in the base set are several configurations and texture sets for the Kfir C7 in Colombian Air Force and Israeli Air Force markings. The expansion pack adds additional configurations and markings for the Kfir C2 of the Ecuadorian Air Force, the Israeli Air Force, and the Sri Lanka Air Force. Also included is the F-21A in United States Navy and Marine Corps aggressor squadrons markings. 4 December 2007 - Michel Gérard sent a few photos from 1980 taken at the Centre d'Essais en Vol (Air Test Centre) in Bretigny (LFPY). Among the aircraft is the Mirage IIIE prototype (N°01) which was used to test various equipments and wore a variety of nose shapes. The photos and description can be viewed here. 27 November 2007 - Patrice Grange has made a new Mirage IIIE for FS2004 and FSX. The aircraft wears the paint scheme made famous by the comics "les aventures de Tanguy et Laverdure" and the TV series "Les Chevaliers du Ciel". Configurations include clean and armed (with wing tanks and rocket pod). The model has full moving parts and animations. A custom instrument panel is also included. 23 November 2007 - Before the month runs out I thought I should make an update to the preview page on the upcoming Mirage III/5 from Mark Harper via Alphasim. Since the first report Mark had added several new versions including instrument panels unique to each version. More details are here along with some new screenshots. 1 November 2007 - Jason Sparkes has repainted the Super Etendard Modernisé of Romain Lucas in a special white tiger scheme worn by 11F Flotille at the NATO Arctic Tiger 2007 event. Only the textures are included so you will also need to download the SEM. 22 October 2007 - Baptiste Aubertel has painted the Mirage III of Warwick Carter in a new polished bare-metal finish with insignia for EC 1/2 "Cigognes" at Dijon. Only textures are included so you will also need to download the original aircraft. 14 October 2007 - Mel Mutter has adapted the 2D instrument panel from Kirk Olsson's Mirage F1 for better operation in FSX. The changes include a new background image and also work in FS2004. 6 October 2007 - A new Mirage III for FS2004 and FSX is under development. This new one by Mark Harper of Alphasim will be based on the IIIE fuselage. It will be packaged to include the Mirage IIIE, Mirage IIIR, and Mirage 5. Several versions based on these airframes are planned. Read more about at and view additional screen shots in this preview. Also, the famous EC 1/5 "Vendée" at Base aérienne 115 Orange-Caritat (LFSO) was retired this year. As is typical of military units a special scheme was applied to one of their Mirage 2000C/RDI for the occasion. Frederic Vrevin (alias Hackmachine) has applied the scheme to the Mirage 2000D/N of Roland Laborie. You can download the aircraft from his website. 15 September 2007 - Patrice Grange has released version 4 of his Mirage G8 package. The package now included 13 aircraft models including both the single-seat Mirage G8-02 and the two-seat Mirage G8-01, different weapon sets and various textures, both real or fictional. The latest improvements include various new textures, new external configurations, a new panel backgound, and full moving parts. The aircraft is fully compatible with FS2004 and FSX. 9.11.2001 11 September 2007 - It is hard to believe that six years have passed. The war that followed that day is still going on. So I think it is important to remember how we got here. Please visit September 11 News.com and the September 11 Digital Archive. 31 August 2007 - As a follow-on to his original description of a meeting of Swiss Vampires fighters and the Mirage IIIE, Michel Gérard has sent additional photos and commentary. This is very interesting reading and as always, the photos are outstanding. 4 August 2007 - Cristiano Magnani has repainted the Mirage 2000C of Roland Laborie in the colors of the black Mirage in the movie Chevaliers du Ciel. The file contains the textures only so you will also need the original Mirage 2000C download. 30 July 2007 - Michel Merle wrote to say that he and the folks at SimAéro Passion have published the first edition of a new online magazine. They are also working on a new comic book, along the lines of Tanguy & Laverdure, that will be based on screenshots from FS. Michel, who has given us several testure sets over the years for the Mirage IV, Super Etendard and Mirage F1, reports that he is working on new repaints for Kirk Olsson's Mirage F1. So stand by. 18 July 2007 - Patrice Grange has painted two camouflage schemes for his Mirage G. Both texture sets are for the two-seater G8-01 version. One scheme is in green/gray NATO colors and the other is a sand/chestnut desert scheme. 13 July 2007 - Jason Sparkes has reworked the original Aéronavale Francaise textures for the Cyril Piofett (alias Gator) Rafale M. The new textures represent two aircraft of Flotille 12F based at Landivisiau BAN (LFRJ) and on board the aircraft carrier "Charles de Gaulle" (R91) in the current low-visibility gray scheme. 9 July 2007 - There are at least two Mirage 2000 projects underway. Roland Laborie (alias Rollus13) has been very busy with his upcoming Mirage 2000-5 project and has included images in the forum at Francesim.com. Siegfried Vlaminck (alias Arrow) has also been busy with his Mirage 2000C project has been posting updates in the Francesim forum as well. Cyril Pioffet (Gator), where are you? 3 July 2007 - Panagiotis and Thanasis, the Delizisis brothers from Greece, have repainted the Mirage F1C of Kirk Olsson in four schemes worn by the Hellenic Air Force. Included is the original Aegean Blue (Mirage bleu) scheme, the Aegean Ghost scheme, and the two schemes worn by 334th Mira Talos and 342th Mira Sparti (below) at the retirement ceremony of the Mirage F1CG in 2003. The package has been configured for use with FSX but there were problems with the initial release so a FIX has been released. 27 June 2007 - In February 2000, fellow Mirage and flightsim enthusiast Michel Gérard began emailing short articles of his experiences with the Mirage in the Armée de l'Air and translating the Quoi de Neuf page for me. I started a page of the articles both in English and French (thanks to Michel sending copies of both). For personal reasons Michel found it necessary to direct his time and energies away from the flightsim community. I am pleased to announce that after six years Michel has returned. He has taken up repainting aircraft as well and so we may see some Mirage repaints with his name on them in the future. Michel has begun sending new articles to accompany the photographs of the Mirage he made over the years. So I have begun a new page here. 23 June 2007 - Patrice Grange has updated his Mirage G8 package. This third revision improves several areas: reshaped nose to better match the real aircraft, realistic markings (from photos he made in the "Musée de l'Air" in Paris le Bourget), operating flaps, repositioned afterburners, a new panel background, and full FSX compatibility of the gauges. Thank you Patrice. 21 June 2007 - Eric Marciano has updated his radar with many new features for instrument panel designers as well as FSX and multiplayer compatibility. Installation instructions are included to update the previous Mirage 4000 and Super Etendard radar gauges. Visit his website for more information. 8 June 2007 - Tony Mézières has been very busy making new scenery. He has released a new French air base scenery at the Virtual French Air Force. This new one is of BA 103 Cambrai-Epinoy (LFQI). It can be downloaded from the Virtual French Air Force website. 4 June 2007 - Pierre Marchadier and the crew at FSfrance.com have been busy with several new aircraft in the works: Mirage IIIC, Rafale B-C-M-N, and Mirage IIIV. Visit their website forum to read about the projects and follow the in-progress images. 31 May 2007 - Patrice Grange has released a second version of his earlier swing-wing Mirage G8. In addition to new weapons loads and a new instrument panel, Patrice has added the single-seat Mirage G8-02 for a total of five included aircraft. 26 May 2007 - Tony Mézières has released a new French air base scenery at the Virtual French Air Force. This new one is of BA 279 de Chateaudun (LFOC). It can be downloaded from the Virtual French Air Force website. 18 May 2007 - I found another French air base scenery by Alexandre Rémy. It is of N'djamena International, Chad (FTTJ) a joint civilian and military base used by the Armée de l'Air while in Chad. 11 May 2007 - Patrice Grange has been modeling some famous but short-lived French fighter designs including the SNCASO Trident III, at one time a competitor to the early Mirage (let us count our blessings), and the Leduc 022. His latest offering is one that fits right in with the theme of this website, the two-seat, two-engine, swing-wing Mirage G8. The Mirage G8-01 first flew 36 years ago this week. 4 May 2007 - I have located some new French Air Force airbases. Included are BA 709 Chateaubernard (LFBG), BA 118 Mont de Marsan (LFBM), and BA 115 Orange-Caritat (LFMO). These are from the Virtual French Air Force website and were made by Tony Mézières. 29 April 2007 - No, it isn't a belated April Fools Day joke. 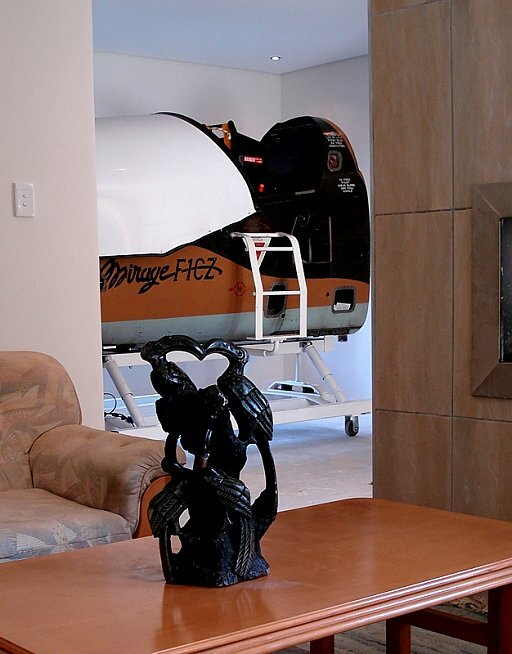 Peter and David Dooley of South Africa (Mirage F1 instrument and flight model) sent a couple photos of what I'm sure is the ultimate fantasy of every Flight Sim and Mirage enthusiast, their Mirage simulator in the dining room. Peter says it is only temporary but it looks right at home to me. 27 April 2007 - Jason Sparkes has updated my Armada Argentina Super Étendard Modernisé textures to include changes in the scheme made after the Falkland Islands conflict 25 years ago. 18 April 2007 - Toni Agramont had updated his Corsica scenery for FSX. Included are over 100 communities and seven airports. 13 April 2007 - Luiz D Zahluth Lins of Brazil has painted textures for the Mirage 2000C of Roland Laborie in the scheme applied to the 12 Mirage 2000C (called F-2000C locally) purchased from the French Air Force to replace the old Mirage III (F-103) of the Força Aérea Brasileira. 2 April 2007 - Gustavo Luna has released scenery for Santa Cruz AB (SBSC) near Rio de Janeiro, and Canoas AB (SBCO), located near Rio Grande do Sul, for FS2004. 25 March 2007 - Alexandre Rémy has released version 2 of his scenery for the French Air Force Base 188 (HFFF) located at Ambouli International Airport (HDAM) in Djibouti. 16 March 2007 - Dennis Husted has made a new instrument panel for the Rafale for FS98 users. The new panel improves the visual quality within the limits of FS98 by making the gauges easier to view. There is also minimal impact on framerate. 10 March 2007 - Bernd Barsch has released five Rafale repaints for FS98. Using the original Rémi Moreau Rafale that Eric Bressant repainted, Bernd has painted two Rafale M (Flotille 12F and the Prototype M02), and three Rafale C (EC 5.330 'Cote d´Argent', EC 01.007 'Provence', and the Prototype C01). Also included is an API file for scenery designers who want to add a very frame-rate friendly static aircraft to their projects. 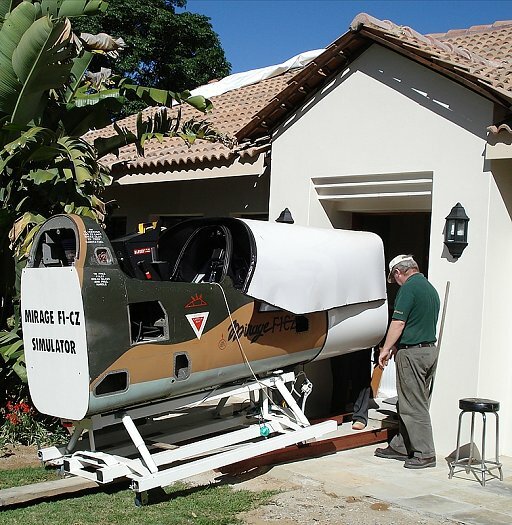 28 February 2007 - Gustavo Luna has released version 2 of his scenery for Anápolis Air Base (SBAN) in Brazil. 20 February 2007 - FSFrance has released their Dassault Super Mystère B2. It is a big download at 34MB. But for that you get a lot. Pierre Marchadier has built eight visual models: clean, with tanks, and three missile options with and without tanks. There are 22 texture schemes by Gilles Mercier that can be applied to each of the visual models. A complete instrument panel with three views by Jean-Pierre Langer is also included. And Jean-Pierre Bourgeois and Benoit Dubé have put together a realistic flight model. This is a very complete package of an important aircraft in Armée de l’Air history. 15 February 2007 - Gustavo Luna of Brazil has released scenery for Anápolis Air Base (SBAN) for FS2004. Anápolis is one of the most important bases for the Força Aérea Brasileira. Previously home to their many Mirage III (F-103) variants it now supports the Mirage 2000B/C (F-2000B/C) of 1º GDA. 15 January 2007 - Eric "Bora" Kunst of the Netherlands put together an AI Flightplan package for Armée de l'Air EC 003 using the Mirage 2000D aircraft by Fernando Martinez based at Nancy Ochey (LFSO) by Alexandre Rémy. Even with the 59 flights that are included everyone has the weekend off. Also included are callsigns by Stewart Pearson and a custom AFCAD2 file. 10 January 2007 - Happy New Year 2007. Let's start the year off with two repaints by Pierre Ledante that I came across at the VirtuelAirAlsace.org website. Both are for Kirk Olsson's Mirage F1CT and represent the 55th (1997) and 60th (2002) anniversary paint schemes applied by EC 2/30 "Normandie-Niémen" based at Colmar-Meyenheim AB. In respect to the author's distribution restictions you must download from the VirtuelAirAlsace.org website.